In the past few years at Barnstable High School, we have dealt with the tragic passings of fellow alumni. The Class of 2015 has dealt with the most loss as four of its graduates have died over the past three years. To honor the students, 2015 graduate Margot Rice led a campaign to install a sculpture in the Astropark. It was unveiled in their honor in August.“They wanted to give a class gift, but also dedicate it to their classmates who had passed” said teacher Mike Gyra, who oversees work done in the Astropark. “After the memorial wall ceremony in the Astro Park this past spring, Mrs. St. Onge approached me with the idea to do a class gift (since our original plan never came to light a few years ago) in the Astro Park for the members of our class that we had lost,” said Rice, 2015 Class President. “Traditionally, the classes leave a gift for the school. They agreed to leave something significant, something that would make a mark,” said Becky St. Onge, the class advisor of the class of 2015. Rice chose something that connected the four deceased students, Justin Aristide, Olivia Brodt, Kraig Diggs, and Justin Galvin-Jutras, together. “Margot thought long and hard. She liked the four elements (wind, earth, fire, and water) because they were all connected,” said Gyra. 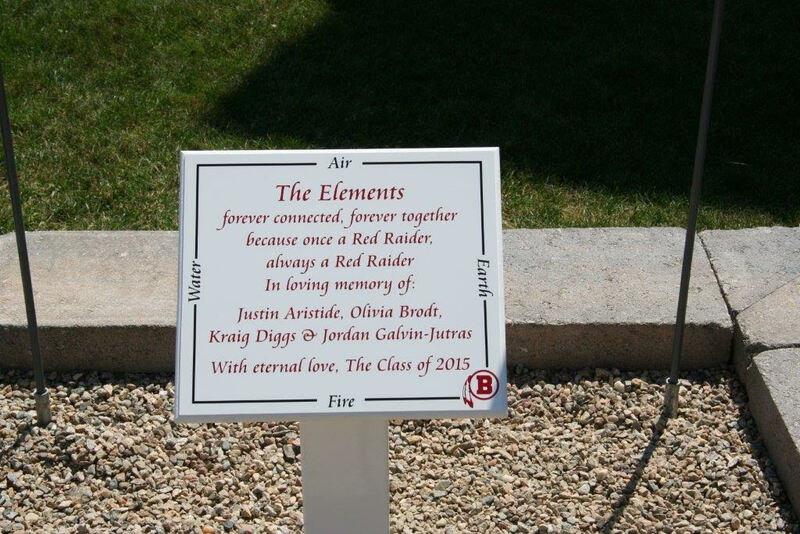 “I really wanted this to be special, to be something that would be able to remind us of Olivia, Kraig, Jordan, and Justin, and how important they were to Barnstable High School and our class,” said Rice. 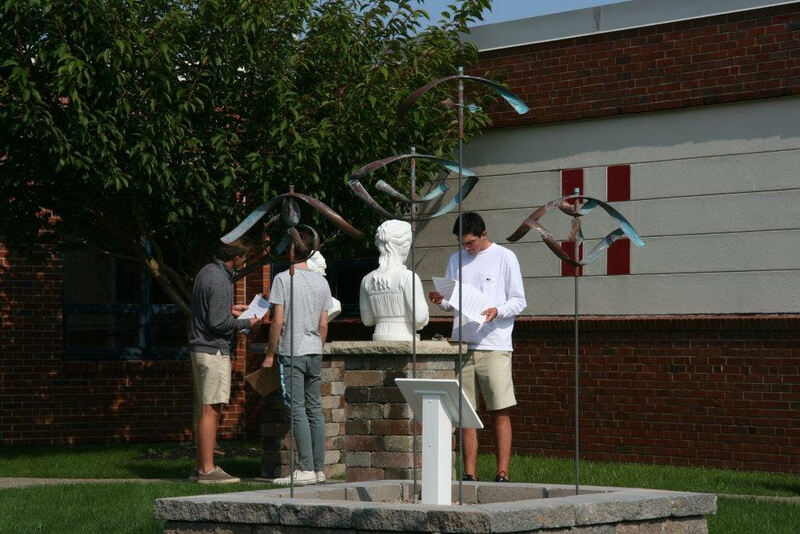 After brainstorming a few ideas, Rice and Gyra concluded that the elements wind sculptures would best represent the students. “He showed me the website, and as we were looking through, I noticed four smaller sculptures for earth, air, water, and fire. Immediately, I thought doing four would be a cool idea for the four we would be representing,” said Rice. “The Elements” can be found in the Astro Park near the Pathway of Discovery. “I think they wanted to put the memorial in a protected place, and in a nice environment, so they selected the park where they’re also many other memorials,” Gyra said. With the help of Gyra, and two very generous donors, Ray Carlozzi and Steve Gagnon, “The Elements” sit surrounded by beautiful stones that complete the memorial. “Ray Carlozzi and Steve Gagnon gifted the beautiful stones that houses the statues. Ray and Steve are extraordinary, thoughtful, and generous supporters of BHS and the Astro Park,” said Gyra. For students who would like to know when they can view the sculptures, it is on display now. “They can see them whenever their teachers bring them out to the Astro Park. There are plenty of opportunities to visit them before and after school as well,” said Gyra. “Sometimes it is nice to have different places to visit those we have lost and want to remember. I hope this can be that for a lot of people,” added Rice.